Sunday, January 6: Singapore is a pristine, characterless faux-Western city filled with waves of young Asian faces. It abounds with high-priced multinational businesses in one connected, shopping-mall-like complex of designer clothing stores, Starbucks coffee shops, 7-Elevens, five-star hotels, Hard Rock Cafés, and home furnishing shops. 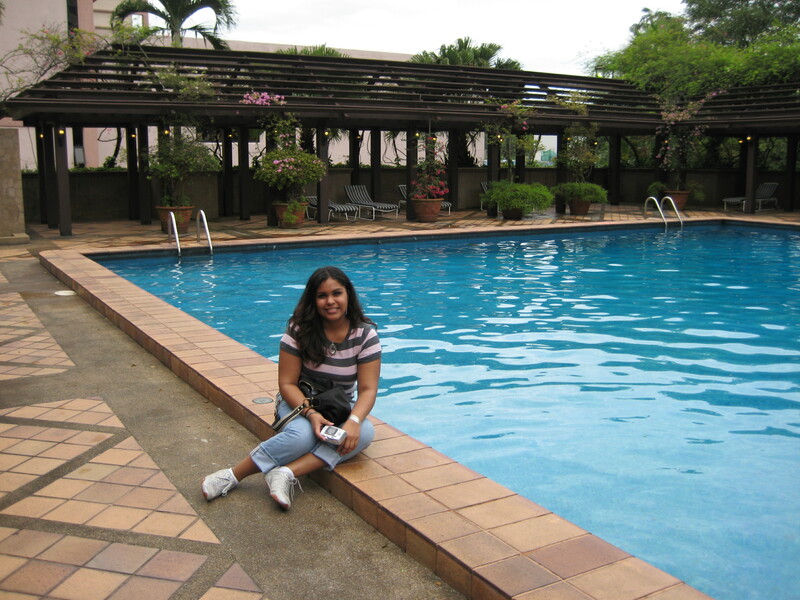 The positives to the city are its lack of traffic congestion, its ethnic neighborhoods of Chinatown, Little India, and the Arab Quarter, its middle-class-looking housing projects, and its well-manicured green spaces brimming with bright flowers and multi-textured leaves. At the ports of the city thrive hundreds of the “state birds,” red and yellow steel cranes, nursing their babies: huge stacks of shipping containers from all over the world. High-rise construction projects are in progress throughout the city. The skyline extends in every direction. 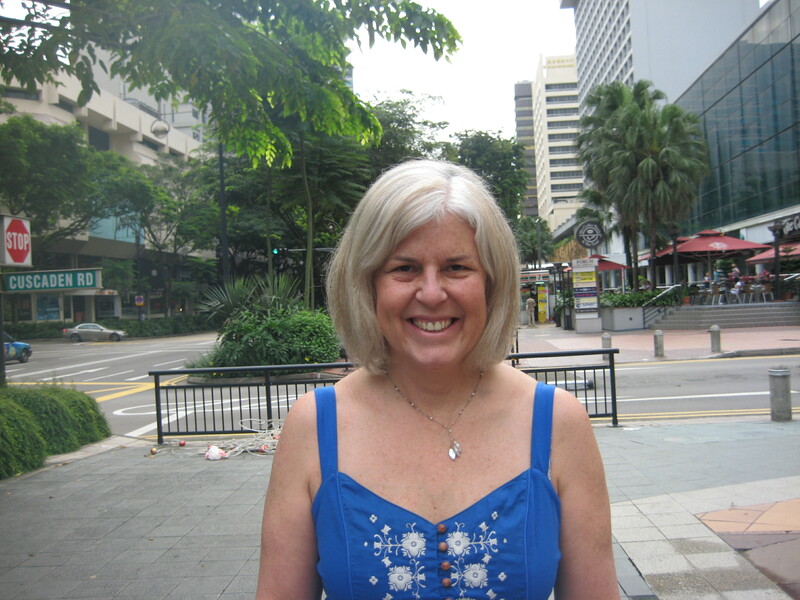 The humidity is oppressive in Singapore and it usually rains for some part of every day. It reminds me of Florida weather, which I hate. As Juliana and I eat an uncomfortable breakfast in the outdoor seating at the Coffee Club, two young women dressed in skimpy mini-skirts and glittery tops stumble past, one holding up the other. Apparently they have just returned from a night-long clubbing excursion and are miserably drunk. 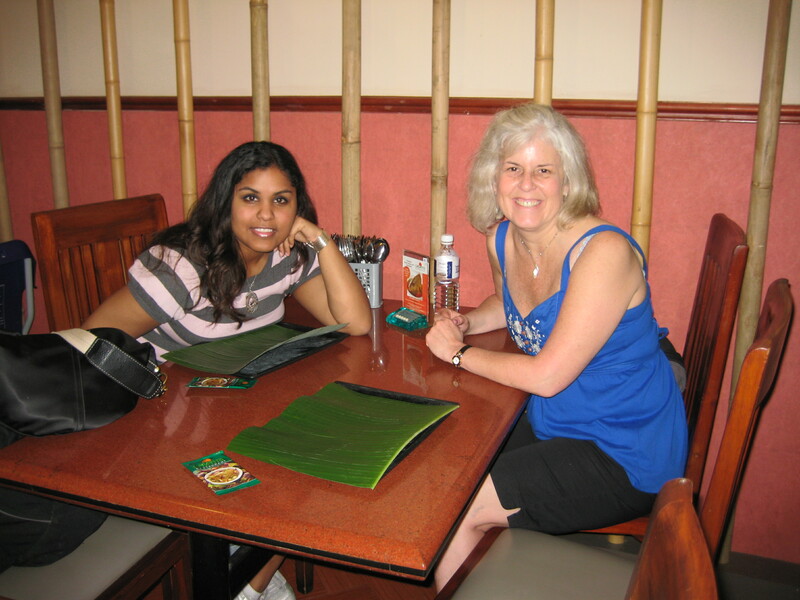 After breakfast, Juliana and I explore some of Little India, an ethnic neighborhood in Singapore that has Tamil and other cultural elements. According to Wikipedia, the Little India area is reported to have developed around a former settlement for Tamil convicts. 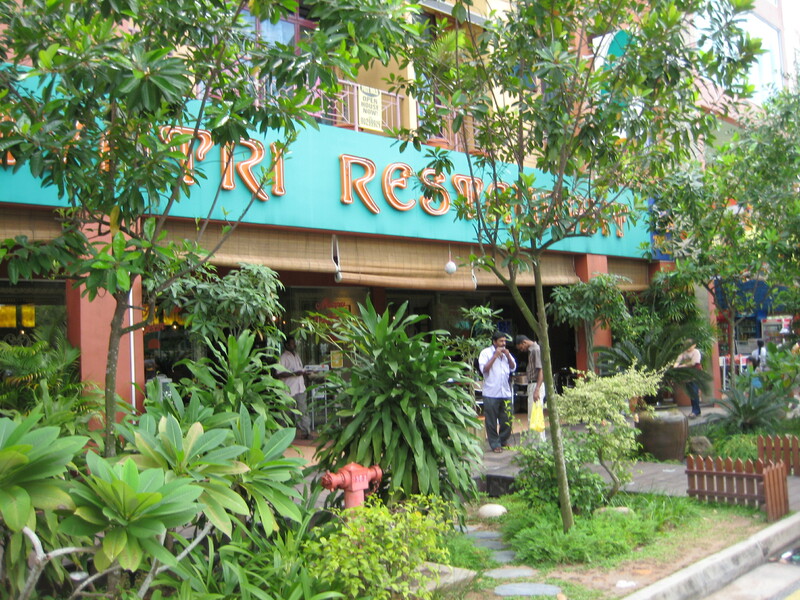 Its location along the Serangoon River originally made it attractive for raising cattle, and trade in livestock was once prominent in the area. Eventually, other economic activity developed, and by the turn of the 20th century, the area began to look like a Tamil ethnic neighborhood. This modest but colourful area of wall-to-wall shops, pungent aromas and Hindi film music is a relief from the prim modernity of many parts of the city. 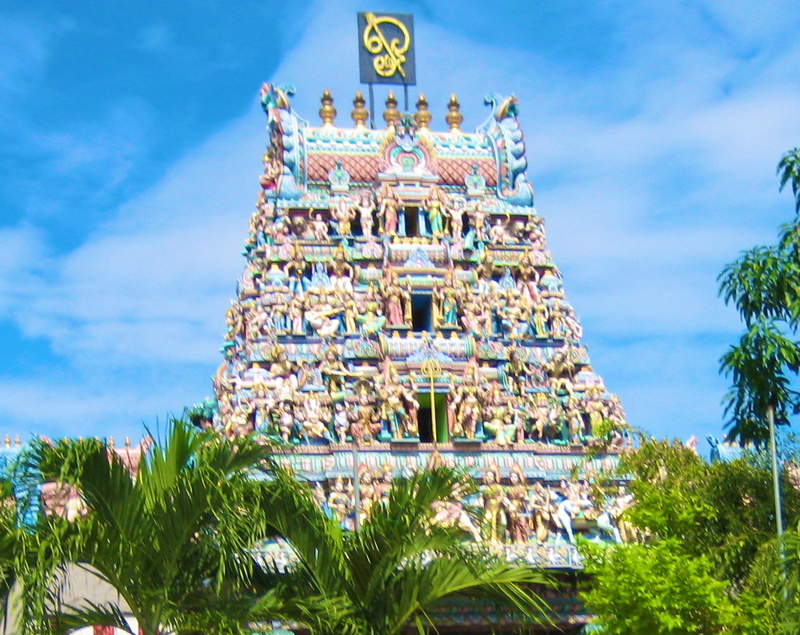 We pass the Sri Mariamman Temple, the oldest Hindu temple in Singapore, with its colorful gopuram or tower with its wild plaster work images of bizarre characters. 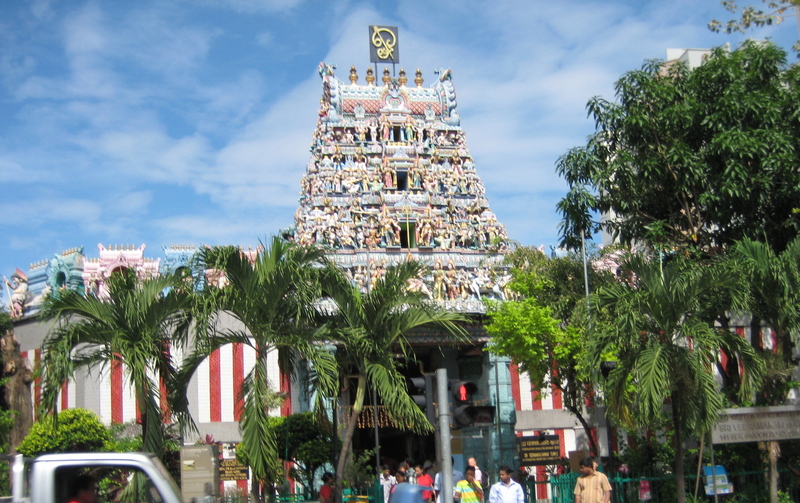 According to Wikipedia, The Sri Mariamman Temple was founded in 1827 by Naraina Pillai, eight years after the East India Company established a trading settlement in Singapore. Pillai was a government clerk from Penang who arrived in Singapore in May 1819. Pillai went on to set up the island’s first construction company and entered the textile trade. He rapidly established himself in business and was identified as a leader of the Indian community. Built in the South Indian Dravidian style, this temple features a gopuram that rises above the main entrance along South Bridge Road. It is richly embellished with six tiers of sculptures of Hindu deities, other figures and ornamental decorations. The tower tapers up towards to a moulded ornamental ridge. The scale of each tier and its sculptures is slightly smaller than that of the tier immediately below it. This helps to create the illusion of height and adds to the symbolic importance of the building. The sculptures are all of plaster, which allows for fine detailing. They are painted in a variety of bright colours, which adds to the visually spectacular quality of the gopuram. 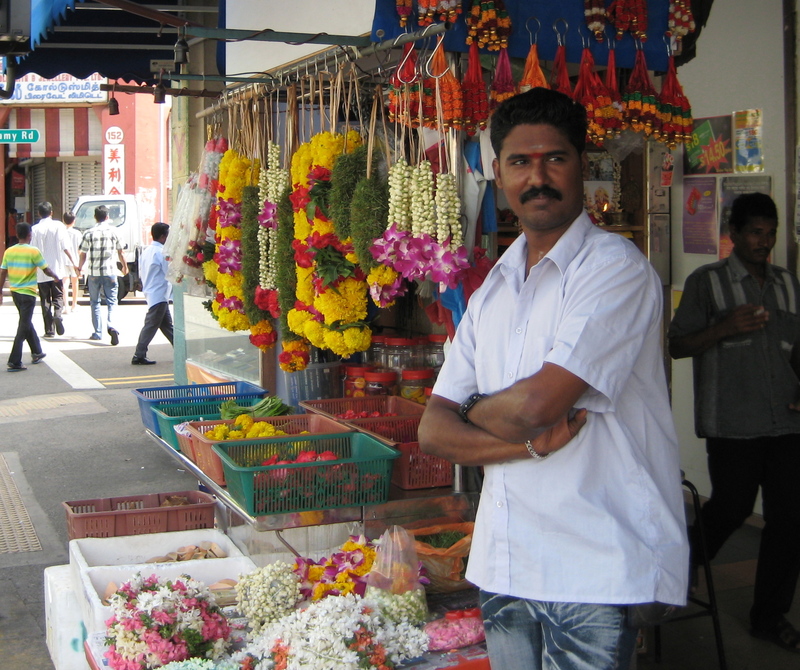 Across from the temple are street vendors selling fragrant flowers that worshipers can buy as offerings to the gods. After a short time, we feel hot and thirsty. Juliana decides she wants a mango lassi, so we walk randomly into an Indian restaurant. A handsome young Indian man, The Straits Times spread out before him, asks us to sit at his table while someone makes the drinks. He points to his name on the restaurant sign over his head: Madan’s. 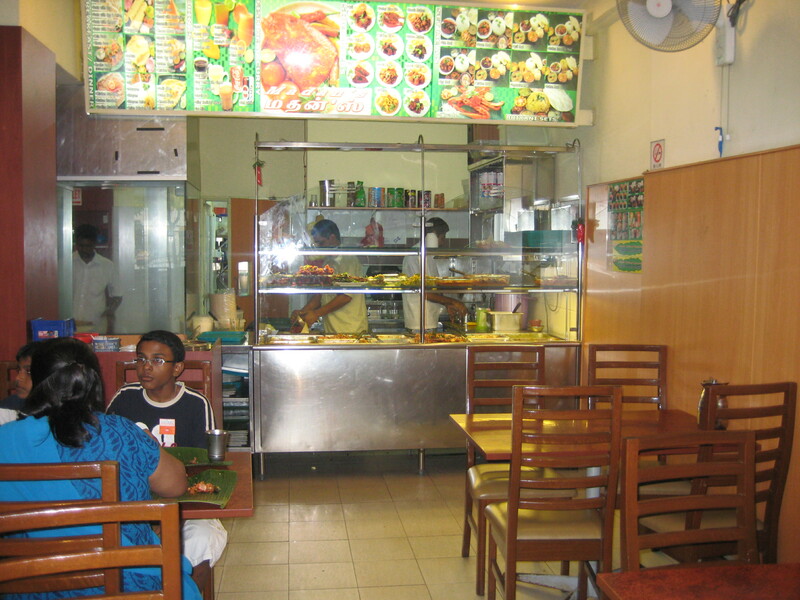 Inside Madan’s. The table on the right is where we sat. When I ask him if he goes to the Hindu temple we just passed on the street, he replies that no, he goes to church. He’s Catholic. I am sitting directly across from him and Juliana is sitting on the same side of the table next to me. He speaks directly to me and hardly looks at Juliana. He asks what I am; I say a fallen-away Catholic, then an Episcopalian, and now nothing. Except that I find Buddhism appealing. He responds that he finds Christianity the most moderate religion in that it accepts other religions. He believes Buddhism is too extreme; one can’t in reality give up the things of this world, such as eating and drinking. He thinks the Muslims are all too extreme and they are taught to be intolerant and violent. He knows about Hillary Clinton and Barrack Obama. I speak of my dislike of Hillary, though I admit voting for Bill. I ask him how old he is and he replies that he is 24. I say, “Juliana is 23!” He doesn’t even look sideways at her. He looks directly at me and says, “How old are you?” Juliana says, “Guess.” He says, “40?” I put my thumb up. He guesses again, “45?” I put my thumb up again and then say, “That’s okay, we’ll stop right there.” He says, “What is the secret of you looking so young? I hope I can look that young when I’m your age.” I thank him and say I don’t have any secrets. He asks if I am married and I say I’m separated. Do I have children? Yes, two sons, 15 and 16. We ask him if there are any fun things to do in Singapore and he suggests the bars and restaurants along Boat Quay. He can’t recommend a particular one because he neither goes to bars nor drinks. He hands me his business card, with “Madan Restaurant” on the front, along with his cell phone number. Then he asks for our emails, which we give him. He says, “I want them in case I ever want to come to America.” He gives us the mango lassis, we pay him and get up to leave. He encourages us to come back for lunch. We stop for lunch at a lovely teak-walled Indian restaurant. The waiter brings out a bowl of rice, some large chips and a large rectangular banana leaf onto which he scoops three types of vegetables. He brings us towelettes to wipe our hands. We feel this all to be quite generous, until we get our bill. Whereas extra, unasked-for things would be complimentary in the U.S., everything is itemized and charged to us! After lunch, we stop into a gold jewelry store where I decide to buy a gold ring. An old bearded Indian behind the counter holds out a small soup ladle filled with a dollop of sweet ricotta-like cheese. He pulls my hand toward him, palm up, and puts the ball of cheese into my palm. It’s sweet and greasy. He hands me a tissue. As I nibble at it, I try to get out my credit card and sign the receipt at the same time. After leaving the shop and eating about half of the cheese, I toss the rest in the trash can. About an hour later, I am feeling nauseous. I don’t know what has done it, the mango lassi or the dollop of cheese! We return to the hotel for a rest before our group meeting tonight. On the elevator at 4:00, I encounter a scene I see quite frequently in Singapore. A frumpy middle-aged American man is rubbing the long slender arm of a wispy, gorgeous Asian woman. He asks her, “What are you going to do now?” She rolls her eyes, looking quite bored. “Going home to sleep,” she answers. He looks so needy: “Love me! Love me!” his eyes seem to say. I notice this phenomenon throughout Singapore: frumpy middle-aged American or Australian men with beautiful, wispy Asian women. 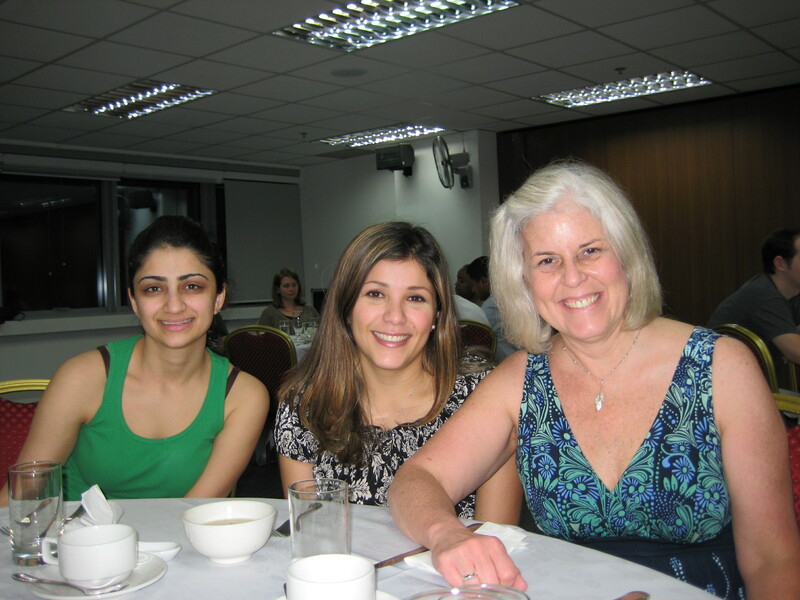 In the evening, the other students from the study abroad program arrive and we attend a welcome dinner at the hotel. 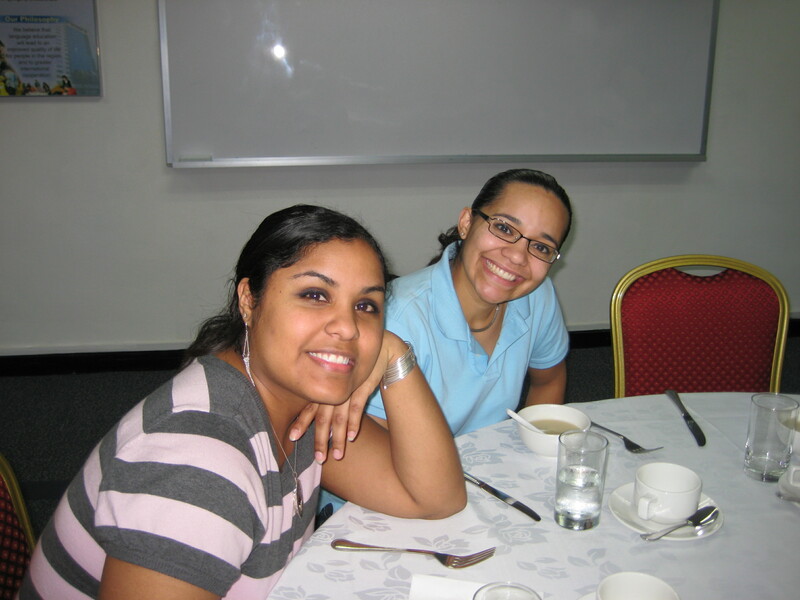 Later that evening, I call Madan as Juliana had encouraged me to do. I can’t think of a thing to say, so I apologize for not coming back to his restaurant for lunch. I tell him we both felt nauseous, so we hadn’t felt like eating and had returned to our hotel. He says, “I hope it wasn’t because of the mango lassi! !” I say, “I hope NOT!” He says it was sweet of me to call and that he will email me to let me know when he is available to meet.